Fans of hip-hop, get ready for the legendary Kendrick Lamar!! The California-hailing rapper is on his “Damn!” tour promoting his fresh new album, with incredible support from SZA and Schoolboy Q! 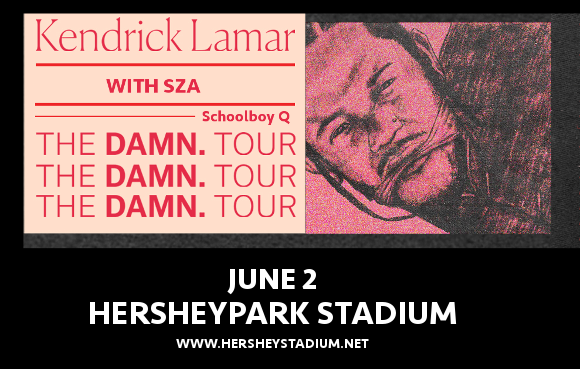 They’re on their way to the Hersheypark Stadium on Saturday 2nd June 2018 – be there!! Tickets will sell out fast so don’t delay – grab yours today, while they last!! Starting out in hip-hop as a teenager, Kendrick Lamar attracted local attention with his first mixtape and was swiftly picked up by a record label. It didn’t take long before he started to gain popularity worldwide, and by the time he released his debut single, ”HiiiPoWeR,” he had already collaborated with massive rappers including Snoop Dog and Busta Rhymes! Get ready to be a part of it all – what are you waiting for?? Grab your tickets NOW while you still can!